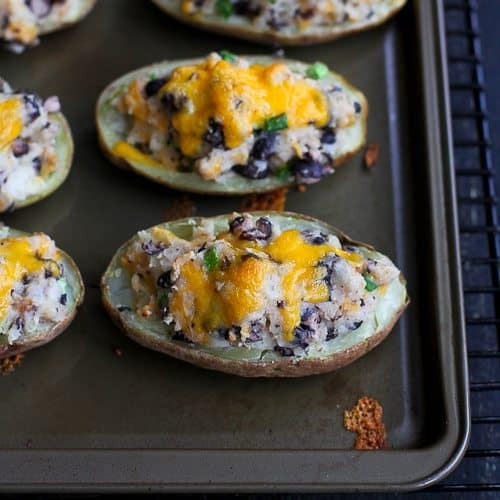 Pull together a healthy vegetarian meal in no time with these lightened-up version of southwestern twice-baked potatoes. You know those times when you just forget to eat? Yeah, me neither (thus, the need for the weight loss journey). But I can see how it might happen when you are running from mall to mall, trying to find that perfect gift for that perfect someone. No, scratch that. I really can’t imagine any situation in which I might forget to eat. But for those of you who do encounter this phenomenon now and then, it’s best to have an arsenal of easy dinner ideas from which to draw. You know, those meals that you can throw together with ingredients that are already in your pantry and don’t require a trip to the store. This is one of those easy meals. 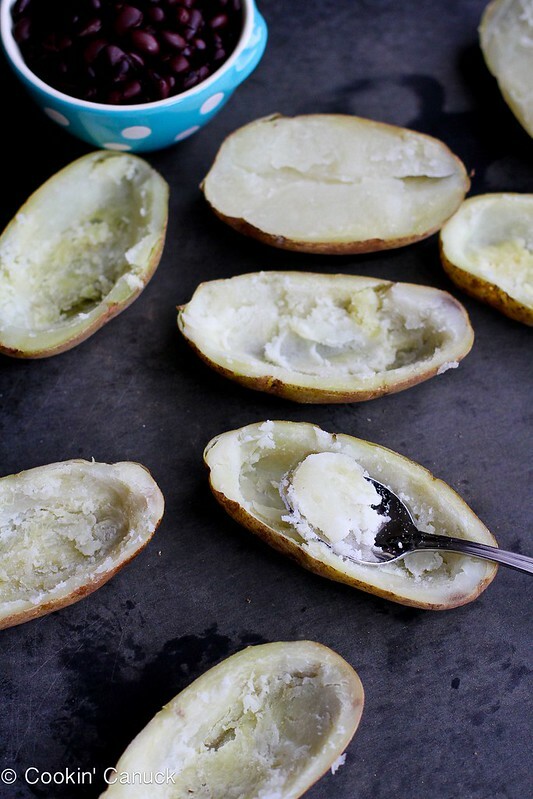 Twice-baked potatoes are one of the first recipes that I learned to lighten up years ago. I think I came across a recipe in an old issue of Cooking Light Magazine and was thrilled with the taste of the recipe. Who knew that “light” could still mean cheesy and flavorful?! I’ve since lost track of that original recipe, but still remember the basic principles. Mash the potatoes with light cream cheese and skim milk, mix in any ingredients that sound appealing and baked with just enough cheese to add the right amount of gooey-ness with out going overboard on calories and fat. In this vegetarian version, I mixed a little cumin and a good helping of black beans into the mashed potatoes for a taste of the southwest. Serving the stuffed potatoes with a healthy dollop of your favorite salsa adds flavor and an extra kick of flavor. With these around, I will never forget to eat dinner! With a fork, pierce each potato in several places. Microwave until tender when pierced with a fork, about 12 minutes, turning halfway through. When the potatoes are cool enough to handle, cut in half lengthwise. Scoop out the flesh, leaving a 1/4-inch border and transfer the flesh to a medium-sized bowl. 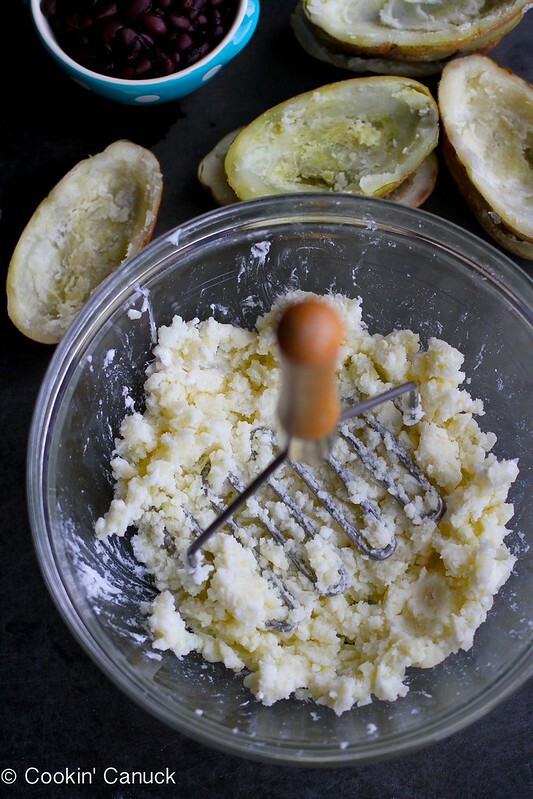 Add the cream and skim milk to the bowl with the potato and mash with a potato masher. Stir the cumin, salt, pepper, black beans, green onions and 1/2 cup cheddar cheese into the potato mixture. Place the potato skins on a baking sheet and divide the potato mixture evenly between the skins. Divide the remaining 1/4 cup cheddar cheese between the stuffed potatoes. Bake the potatoes until the cheese is melted and the skins are slightly crisp, about 15 minutes. Garnish with green onions and serve with salsa. When the potatoes are cool enough to handle, cut in half lengthwise. Scoop out the flesh, leaving a ¼-inch border and transfer the flesh to a medium-sized bowl. Stir the cumin, salt, pepper, black beans, green onions and ½ cup cheddar cheese into the potato mixture. Place the potato skins on a baking sheet and divide the potato mixture evenly between the skins. 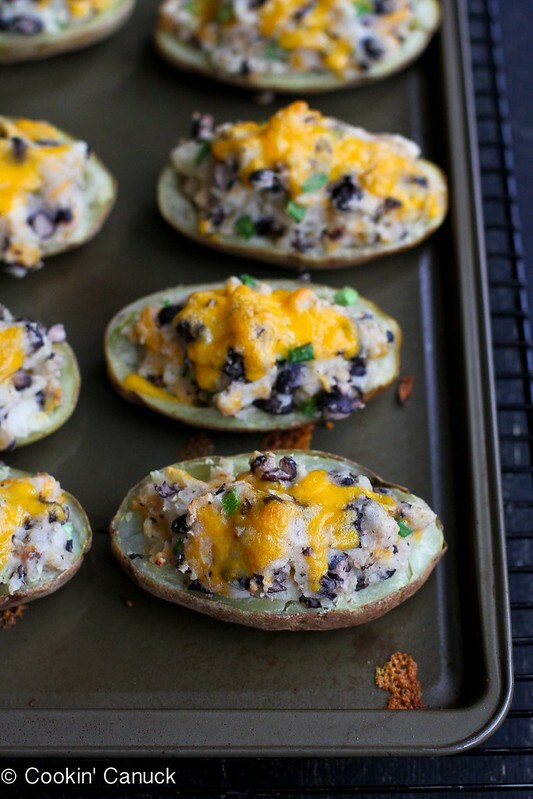 Divide the remaining ¼ cup cheddar cheese between the stuffed potatoes. I love fun meals like this! Pretty and simple. Great recipe! Thanks, Katrina. I will definitely be making these often. Luckily, the family gave me the thumbs-up to make them as often as I want. I love that this recipe doesn’t look “light” but it is! 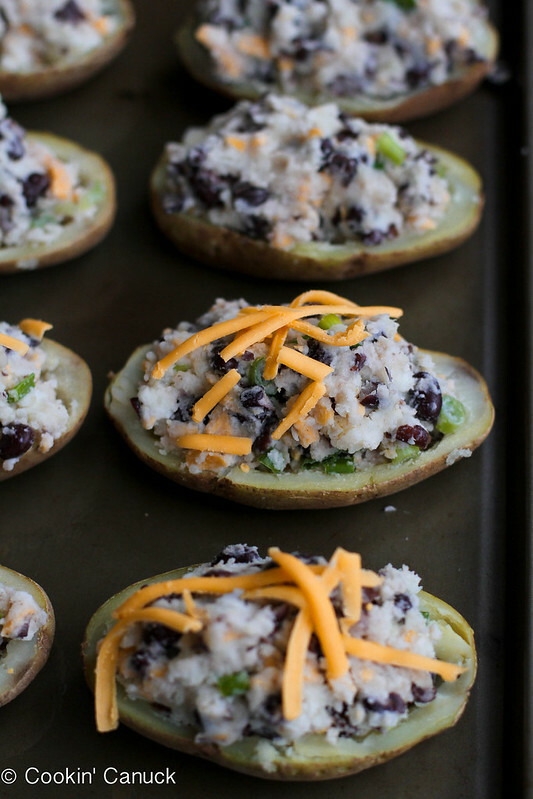 Twice baked potatoes are a favorite of mine, and I am lovin’ this southwestern spin on them. Plus, that melty cheese on top? Ya, that’s good right there. Thanks, Taylor. Oh yes, that melty cheese is a must! 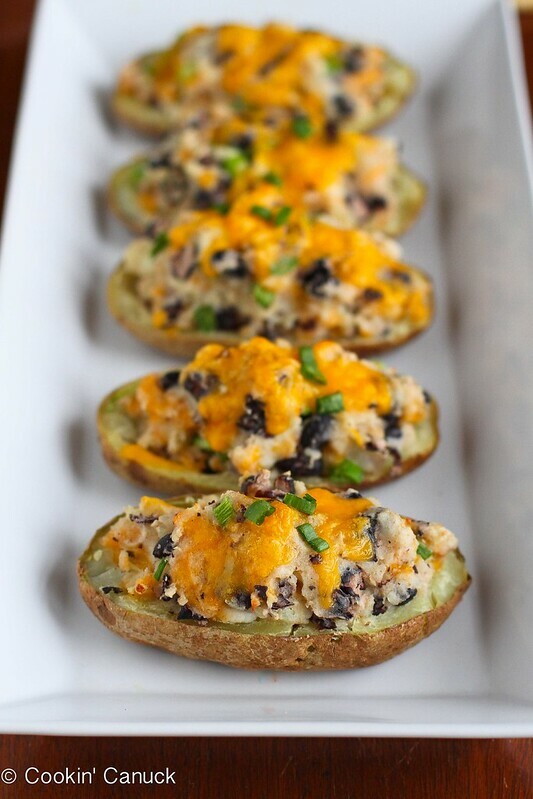 Love twice-baked potatoes, but don’t like all of the calories! Thanks for sharing a lightened-up version! Thanks, Sommer. I feel the same way and have always avoided the calorie-laden ones in the past. This version gives me an excuse to make them more often. 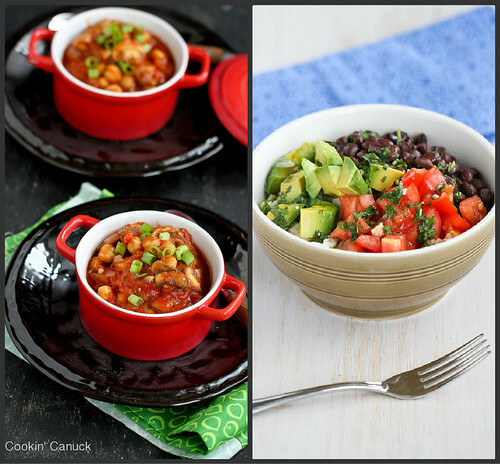 These are such a great winter meal that is still cozy, but healthy!! They sound awesome! These look great! 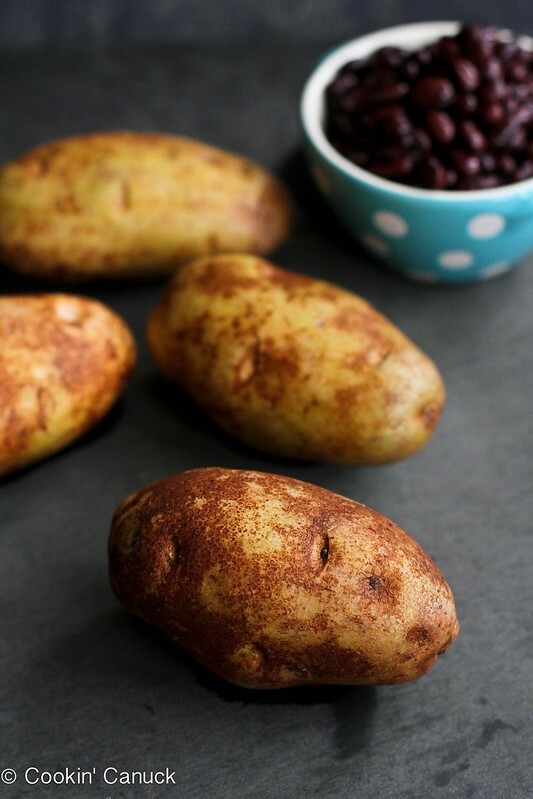 I love how they’re basically a whole meal… in a potato 😉 I love those Southwestern flavours so this is right up my street 🙂 pinning to make soon! Thanks, Becca. We paired these with a spinach salad and were perfectly satisfied. I hope you have a chance to try them! Fantastic…. I think I will make a bunch and eat some and freeze some. And I think sour cream will also go well as one of the toppings. Thanks. Forget to eat? What’s that? 😉 Drooling over these potatoes!! And thank you for the chili shout out! LOL. I feel the same way…I could never forget. Your chili looks fantastic, Liz! I would definitely make this. Thanks for sharing it. Thanks, Norma. I hope you have a chance to try it. It doesn’t disappoint! Ha! I don’t think I’ve ever forgotten to eat… love this version of Twice Baked. Thanks for an easier on the waistline version. I love these Southwest flavors! Thanks, Laura. I feel the same way. I can always find an excuse to use black beans and salsa. Love this meatless option for dinner Dara, especially during this busy holiday season! These look amazing Dara!! We have been eating more potatoes lately since the kids love them so much, I need to introduce them to twice baked potatoes like these. What a delicious light option for dinner! This looks wonderful, saving for Meatless Monday! I love recipes like this. So much flavour in a perfect bite. The photos are fabulous. I LOVE twice baked potatoes 🙂 so delicious!! Yum, these look and sound delicious!